With total import volume standing at 71.49 million tons in 2018, up 19.7 percent on a yearly basis, Russia's share was about 15.7 percent, ahead of Saudi Arabia and Angola, according to a report jointly released on Saturday by the China Petroleum Enterprise Association and a research center of the University of International Business and Economics. 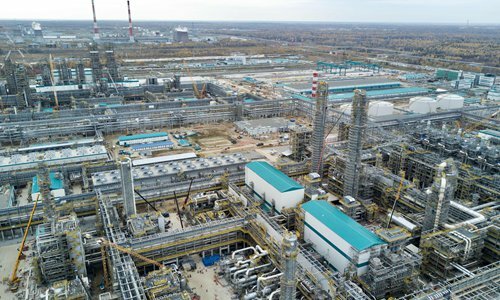 Over the past six years, Russian crude oil exports to China more than doubled, while revenue generated by those exports to China have contributed to some 40 percent of Russia's fiscal revenues, said the report. China's overseas crude oil sources expanded to more than 10 countries in 2018, and the US ranked among the top 10 for the first time, although the proportion the US had was small compared with major suppliers, standing at about 3 percent in the first quarter of 2018. Last year, China's crude oil imports surged 10.1 percent year-on-year to 460 million tons, a record high, figures from the National Bureau of Statistics (NBS) showed in January. Crude production in the country fell in 2018 but at a slower pace compared with 2017. Total output stood at 190 million tons, down 1.3 percent year-on-year, NBS data showed. Surging demand for crude oil has driven China's imports as the nation has established new oil refinery capacity and expanded its strategic storage, said the report, adding the falling output of domestic crude oil has also bulked up the imports. According to the report, the growth rate of China's petroleum demand will witness slight decline in 2019 while imports will continue to increase, pushing the dependence on foreign oil to nearly 72 percent. Meanwhile, natural gas imports came in at 90.39 million tons in 2018, up 31.9 percent year-on-year, according to the NBS data. Production of natural gas also saw obvious increase last year amid government efforts to encourage the use of clean energy. Total output came in at 161 billion cubic meters, up 7.5 percent year-on-year. The report forecast that in 2019, China's natural gas imports would hit 143 billion cubic meters and dependence on foreign imports will increase to 46.4 percent from last year's 45.3 percent. As the country has set its goal to build a low-carbon, high-efficiency clean energy system to boost its energy transformation, demand for crude oil will wind down, according to the report.